The SentrySafe Digital Alarm Safe is equipped with hidden keypad with dual key entry and a loud audible alarm to provide modern advancements to protect against theft. The safe also features four large live-locking bolts, bolt-down hardware, a pry-resistant hinge bar, and third party verified protection from fire or flood for a powerful storage solution for any home office. In addition, the safe includes a multi-positional tray for flexible organization. 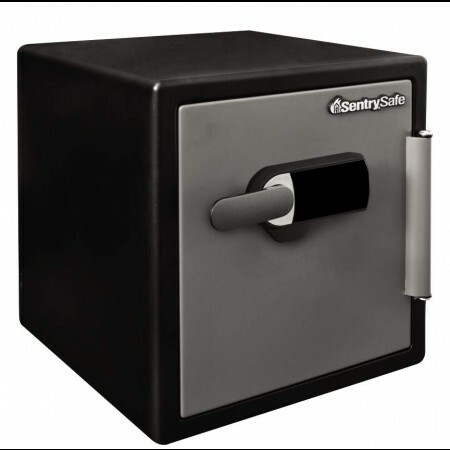 These safes are available for purchase for $299 in the SentrySafe store. Have you ever owned a safe? If so, what prompted you to get it? If not, why not? The sweepstakes starts on Wednesday, November 05, 2014 and ends on Monday, November 17, 2014 at 11:59 a.m. (EST), and is open to all Mocha Mocha Man Style readers, subscribers, and/or fans 18 years old and older in the continental U.S. and Canada. No purchase required. Relatives and employees of Goodall Family Media are not eligible to win. You are also ineligible if you’ve won a prize from this website within the past 30 days. One (1) winner will be chosen via Random.org and announced soon after the ending date. You must leave your contact information to collect your prize. If a winner does not respond within 3 days, a new winner will be chosen. Disclosure of Material Connection: I received compensation and/or one or more of the products or services mentioned above for free in the hope that I would mention it on my website. I am disclosing this in accordance with the Federal Trade Commission’s 16 CFR, Part 255: “Guides Concerning the Use of Endorsements and Testimonials in Advertising.” All opinions are my own. Allow 3-6 weeks for giveaway fulfillment. Total prize value = $299. To see the winner, visit our Winners Page.